The biggest mistake I made in presenting the first version of this game was that I expected everyone to have read the novel and be on the same page with their appreciation. 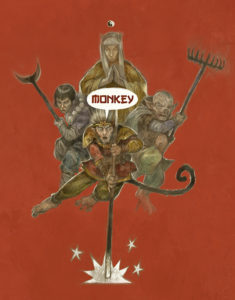 I believed, wrongly, that there was a homogeneous presentation of Monkey King, mainly because I had only been exposed to a very limited selection of the adaptations of the tale (mainly the 80s Japanese TV Series and the Arthur Whaley translation Monkey). This assumption was a mistake since the Monkey King is a Chinese culture hero, in the same way as Robin Hood is to the English, and there are numerous TV series, films, comics and translations of the novel. Some of them stick faithfully to the book, and some are the creator’s take on the tale. The sources that I give in the Bibliography section of the game are the sources I pulled on when putting together this second incarnation of the game. It’s a much broader selection of media, which has had an enormous impact on how the game is written, from the narrative frameworks, the assumptions surrounding the non-player immortals, to the game mechanics themselves. It’s still just a drop in the ocean of the massive body of work that’s been worked on and reinvented over hundreds of years. Thousands if you take into consideration that the Journey to the West incorporates earlier folk tales that have blended with the historical journey of the real life ‘Tripitaka’ who travelled the Silk Road to India to collect the lost scrolls of Buddhism. 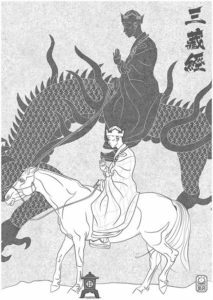 Your experience with the Tale of the Monkey King may be different than mine. It might be more detailed, or this may be that this is the first time you have come across him. The important thing is that you don’t let your level of knowledge put you off. Read the book, follow the rules and guidelines and play the game. Between you and your players co-creating the story of your little band of Pilgrims as they go to Inidia to collect the lost scrolls. Tripitaka contemplates the illusionary nature of reality by Dan Barker. Gosh, it’s been a while ( summer holidays and all that), but work continues getting the core rule book together. One of the new pieces I’ve written for the second version of the game is a section that allows you to create your version of the Tang Monk, Tripitaka in the book/film/tv series, who the player Immortals are responsible for escorting safely to India. 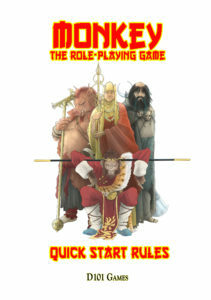 This process is a much shorter version of player immortal creation, which produces a character whose weakness and abilities can be called upon by the players during play as well as being a Narrator controlled character who can berate them for their moral shortcomings and keep the more boisterous in line. The following is an extract, the unedited Step 1 which determines the monk’s origin story. Here are some examples, with card randomiser. Like the player Immortal creation system, players may modify the following examples or come up with their own. The examples are meant to inspire not restrict. (Club) They had a profession before they entered the Monastery. A war weary solider or a Mandarin sick of the politics of the outside world. They have the skill associated with that past profession, e.g. Solider or Mandarin , at Rank 5 but are loathe to use it. Players may use it once per session, but the next session the Monk will politely decline and it is unavailable for use. (Spade) Bon to poor peasants they were left at the Monastery’s gates and raised as a monk from childhood. They have a Buddhist 5. Instead of Buddhist 4. (Diamond) The monk is a Fox Spirit, whose parents thought it would be a fun prank to see how the child from such a colourful background coped with the austere upbringing of the Monastery. The monk may be completely oblivious to their supernatural nature. Under Magic put Shape change (Fox to Human) and Trickster spells. The monk will be unwilling to use their magic abilities and will only use them in a situation where harm may befall someone as a result. Even when they use them, like monks with a prior profession, they will refuse to use them next gaming session. (Heart) They are an advanced Buddhist soul reincarnated in the monk’s body. The monk in addition to any other attitude they gain in step 2 below automatically have the attitude Kindness, which is both Yin and Yang! This is because this advanced soul understands how to be gently kind, soothing another’s pain with soft words, as well as showing tough love and doing things for the recipient of their kindness that they may not immediately appreciate. Write it down as Kindness (Yin and Yang) on the Monk’s record. (Jack) The monk is being sent to India to atone for being disruptive to monastery life. They are young and inexperienced and their Abbott is convinced that the trails they will face on the road will straighten the out. In addition to the Weakness generated in Step 3 write down “Young and Naïve”. (Queen) The monk is a female nun. (King) The monk was the Abbot of their Monastery. They have the Skill Mandarin at a rank of three, which shows their skill in administration. (Joker) The monk is a Demon, who initially attempts to tries to sabotage the mission to collect the missing scrolls. Initially their attempts are subtle and covert, but become increasingly obvious. When the player immortals confront it and successfully overcome it, it repents and swears and oath to successfully complete the mission. The Demon Monk, has the magical abilities Shapechange and Invoke Fear and the skill of Demon and the Weakness “Prone to resolving problems with violence”.